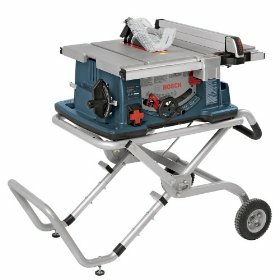 Bosch Table Saws are one of the top selling power tools on the market today. They are known for their power, accuracy, and, most importantly, highly innovative features.
.	A very spacious 29" x 21½" aluminum table surface which makes these tables look almost as big as any full sized saw you can find on the market today.
.	A full featured miter gauge and a pair of full sized T shaped miter slots. This particular feature makes Bosch saws compatible with a number of accessories available on the market today.
. Both the table and the extension have a very smooth finish which makes sliding wood an effortless process. You do not have to apply wax or any other lubricant on the surface as it has a glass beaded finish.
.	A unique smart guard system which consists of a riving knife system, anti kickback pawls, and a modular blade guard. A lot of professionals consider this an amazing addition to Bosch Table Saws as such safety features are usually seen only in a handful of expensive high-end saws.
.	A strong 10" 40-tooth carbide tip saw blade.
.	A one-of-a-kind Gravity Rise wheeled stand which helps you raise and lower the table saw according to your convenience. It contains large, durable pneumatic tires which help you move the saw smoothly even on a rough surface.
.	A Digital Measuring Display which helps you set cut widths with incredible accuracy. It can be attached to and detached from the rip fence using the built-in magnets.
.	A well designed rip fence which improves the cutting performance of these table saws considerably.
.	An integrated sub base which protects the base of the saw. It also contains inbuilt handholds which makes it easier to carry the saw wherever you go.
.	A powerful 15 AMP motor.
.	Arbor lock which makes blade changing a very simple process. Some models from Bosch do not come with the Gravity Rise stand and the Digital Measuring Display. However, you can upgrade your saws by buying the stand and the display separately. A lot of reviews mention that the dust collection system of these table saws is quite impressive as only a very small amount of dust escapes above the table. Another thing which surprises most people is the fact that these saws are very easy to carry and they do not occupy a lot of space. So, they are ideal for woodworkers who have small working areas. Going by the reviews, I can definitely say that Bosch Saws offer great value for your money. While they are certainly not a replacement for contractor type saws, they handle a wide range of woodworking chores surprisingly well. So, based on your needs, it can be a good addition to your workspace. Return From Bosch Table Saws Page to Home - Finishcarpentryhelp.com.